Revised rendering of proposed synagogue at 230 Mason Street presented to the Historic District Commission on September 12, 2018. Rendering of proposed synagogue at 230 Mason Street presented in July to the Historic District Commission. A revised rendering of a proposed synagogue at the corner Mason St and Havemeyer Place was presented to the Historic District Commission on Wednesday. Attorney Tom Heagney listed changes to the design made since July when the proposal was first presented to the commission. Heagney said architect Rich Granoff had gone “back to the drawing board” to “address symmetries” and incorporate the commission’s feedback. Granoff talked at length about symmetries and asymmetries of the neighboring historic buildings including the fire house, which was recently rebuilt in its original art deco style, the Armory, the former Wells Fargo building (originally built in 1922 as a Masonic Temple) and the Town Hall Annex (originally Greenwich High School, now HATG housing). He said that with the revisions, a corner of the building adjacent to Weber Fine Art has been pulled back a bit to create a pocket park and orient the building slightly toward Greenwich Ave.
Granoff said it had been a challenge to reconcile the HDC’s July criticisms of the proposed synagogue as “too modern” considering they had previously approved the design of Richards. “Scale is very important. You said it looked out of scale, too big,” Granoff continued, adding that he had studied the scale of buildings in the area and that the fire department was out of scale. Also he said the new design breaks down the mass of the building by setting back the third story and creating a roof deck as part of the teen center. When commissioners bristled at the idea of a teen center with access to a roof deck, HDC chair Stephen Bishop said that matter would later be addressed by the Planning & Zoning commission. Granoff explained that the preschool would be on the ground floor, and have a separate entrance on the side of driveway between the Armory and the synagogue. Maryashie Deren, Rabbi Deren’s wife, said the preschool will accommodate 55 children. Worship space inside proposed Chabad synagogue. Another change since the first rendition is that the worship space is now recessive. “You can still see it and know something is going on, but it’s not in the foreground,” Granoff said. Summing up the changes made in response to the HDC’s feedback that the building was imposing, Granoff emphasized that the third floor had been pulled back and the pocket park created. Granoff, who earlier in the meeting had received glowing praise for plans to convert office space to residential units in three buildings at The Mill in Glenville, looked surprised at the commission’s negative response to his revisions. “We don’t have the luxury of setting it back further,” Granoff replied. “We are trying to put in a lot of stuff in this. You’re out of your purview here,” he continued, adding that height, FAR and setback are regulated through P&Z. “We’ve consciously broken down the volume to make it in context. As opposed to the fire department, which is almost four stories of straight up wall. But you don’t think that’s too massive?” Mr. Granoff asked Mr. Bishop. Central fire house is set back from Havemeyer Place far enough to accommodate the length of a fire truck. Mr. Bishop pointed out that the fire station is set back from Havemeyer Place, and is set further back than the fire station it replaced. “I don’t like it. I don’t find it attractive,” Mr. Bishop concluded. And, unlike the July HDC meeting, this time neighbors attended the meeting, and they were invited to voice their opinions. “We thought you were our voice,” said Linda Hannett, a 38 year Greenwich homeowner. Hannett said she’d been involved in the movement behind preserving the character and charm of the town in the 1980s. Rose Nichols who has lived in Town since 1982 said she was surprised that “the shed” could be torn down. The neighbors said they thought there was a legal protection for the Armory. “It’s not protected – the shed or the Armory itself can be torn down,” Heagney said. HDC chair Mr. Bishop explained to the residents that there is no protection for the Armory and the owners could tear it down if they wanted to. He said it’s on the National Register, but not a historic district. Granoff and Heagney explained that what they seek to preserve would be 6,000 sq ft of the original Armory, not just its façade, which had been the case in a proposal several years earlier. They said that the Nitkins, who are selling the rights to Chabad to build the synagogue in place of the shed and parking lot, will keep the 6,000 sq ft of the Armory and maintain their offices there. Mr. Heagney said the Armory will remain on the Town’s tax rolls, but the Chabad Synagogue will not be on the tax rolls. He said the parking garage, which would be shared among the Greenwich Financial Center, Armory and synagogue, may or may not be on the tax rolls and that that would be negotiated with the assessor’s office. Mr. Bishop explained to the residents that the applicant is offering to save the Armory in exchange for HDC’s recommendation of the overall plan. He said, from there, if Planning & Zoning approves the plan, the preserved part of the Armory would be protected in perpetuity in exchange for the zoning benefits. “Wow, a veiled threat,” Ms. Hannett said. “What are we meant to aspire towards?” he asked. “I don’t know. Honestly, I’m not happy with what’s there. I doesn’t fit. It’s out of character with the Town, location and other buildings,” Mr. Toraby said. “You’re saying there is continuity to these six (neighboring buildings) architecturally? There is zero continuity,” Granoff retorted. “I design for context. There’s six six beautiful buildings and I’m trying to create a seventh. You call yourself an architect?” he said to Mr. Toraby. 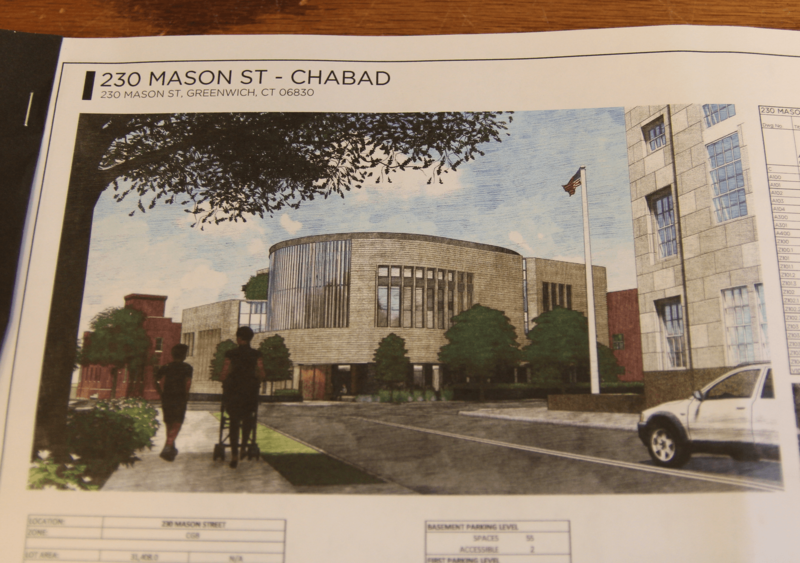 Granoff said the design had been vetted with the Chabad community. “Everybody loves it,” he said. The application was left open. Rendering of synagogue with revisions presented Sept 12, 2018 to HDC. View is from Havemeyer Place with Weber Fine Art at right. Architect Rich Granoff showing residents and HDC commission renderings of revised design of proposed synagogue (view is of entrance now oriented to Havemeyer Place). Sept 12, 2018.